If you have a good wind resource and land that is well-suited for wind turbines, you still must consider how your community views and regulates wind power. Communities around the country are working to find the best ways to permit and tax wind generation facilities. Their decisions are vital to windy areas because they determine the impacts and benefits of wind energy projects for the broader community. Some states, like Minnesota, have developed statewide policies but still involve local agencies in the process, while most states leave it to the counties or other local permitting agencies to create regulations and issue permits. Good project planning means knowing early on what the local requirements are and designing the project to be consistent with those requirements. 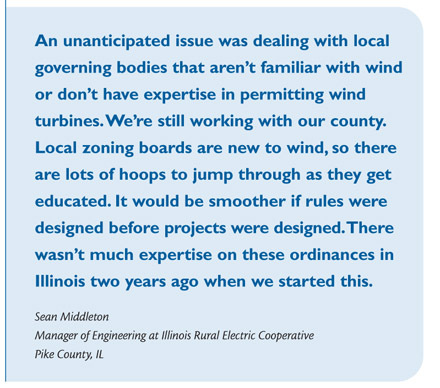 Investigating zoning laws early in the development of your wind project can help avoid unnecessary delays. This section is intended to give you a quick overview of permitting and zoning regulations in several Midwest states. You can learn about the local zoning laws affecting your wind project by consulting your local county officials or a lawyer familiar with your jurisdiction. The National Wind Coordinating Collaborative (NWCC) has published a handbook, "Permitting of Wind Energy Facilities", which is an excellent resource for more specific information on state by state guidelines and case studies. Additionally, when wind energy expands into a new region, cities, counties and even states may formulate new zoning and permitting laws specifically to address the siting of wind turbines. These laws can significantly influence the pace and practicality of wind energy development, as well as determine how the broader community will benefit from wind energy investment. Overly restrictive permitting and zoning laws can discourage development even in areas with good wind resources, while a law intended to encourage wind energy development can backfire if its effect is to reduce tax revenue for the community or diminish protections for neighbors of wind projects. In many states, the primary permitting jurisdiction for wind facilities is the local planning commission, zoning board, city council, or county board of supervisors or commissioners. These local entities typically regulate through zoning ordinances. In addition to local zoning approval, permitting under local jurisdiction may require a developer to obtain some form of local grading or building permit to assure compliance with structural, mechanical, and electrical codes. In some states, one or more state agencies have siting responsibilities for wind developments. These may include: natural resource and environmental protection agencies, state historic preservation offices, industrial development and regulation agencies, public utility commissions, or siting boards. Depending on the state where the wind development is proposed, state permits may be needed in addition to local permits. In other states, state law may supersede some or all local permitting authorities. In some cases there may be a coordinating or lead agency, or a “one-stop” siting process housed under one agency. Depending on whether the permitting jurisdiction is state or local, wind projects may also be subject to local and state environmental policy acts. These laws generally adhere closely to the language of the National Environmental Policy Act (NEPA), described below. The content requirements of these laws parallel those of federal law, except where specific language narrows the scope of the impact statements. There are a number of federal agencies which are likely to be involved in permitting any wind project. In some cases (notably in the West), federal land management agencies such as the Bureau of Land Management (BLM) or the United States Forest Service (USFS) may be both the manager of the land and the permitting authority. Additionally, agencies such as the Bonneville Power Administration (BPA) or Western Area Power Administration (WAPA) may be either a wind project host or the customer for the power. Additionally, if property is part of a land trust through the Conservation Reserve Program (CRP) or Forestry Stewardship Counsel (FSC), this status will effect what land use is allowed. 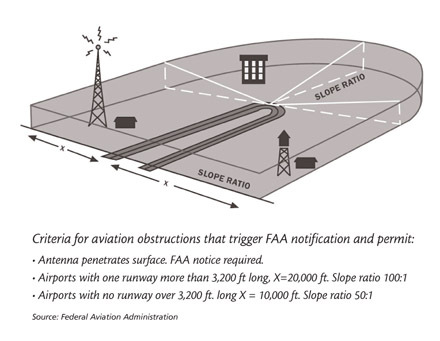 The Federal Aviation Administration (FAA) is another federal entity that is almost always involved in permitting a wind project, because every structure over 200 feet tall, within a certain radius of an airport, or within critical flight paths must be permitted by the FAA. Projects must meet FAA lighting requirements and regulations for siting. To determine these factors for your project you must fill out FAA forms 7460-1 and 7460-2. Tall cranes used during construction will also require FAA permits. If the project poses potential impacts on wildlife habitat or species protected under the Endangered Species Act, the Bald and Golden Eagle Protection Act, or the Migratory Bird TreatyAct, wind project permitting will most likely involve coordination and consultation with the United States Fish and Wildlife Service (USFWS). When federal agencies or federally managed lands and resources (monetary or otherwise) are involved, the requirements of the National Environmental Policy Act (NEPA) will apply. Compliance with NEPA will be required if the wind development or authorization to develop is a federal action, qualifies as “major,” and has potential for a significant environmental impact. If a wind project is proposed on federal land, a federal agency has the power to control the authorization of the wind project (e.g., a federal permit or lease is required). Where multiple federal agencies have NEPA responsibilities, a lead agency will be appointed to coordinate NEPA compliance. If wetlands are nearby, you should consult with the Army Corps of Engineers to determine if the construction of your project has the potential to have adverse impacts and how best to deal with them. Before beginning construction, your project will also need to obtain a National Pollutant Discharge Elimination System (NPDES) permit. As part of the application process for this document, the project must create a storm water pollution prevention plan (SWPPP) that explains how you will control storm water. Contact the state pollution control agency to figure out the process for formulating the SWPPP and obtaining a NPDES. 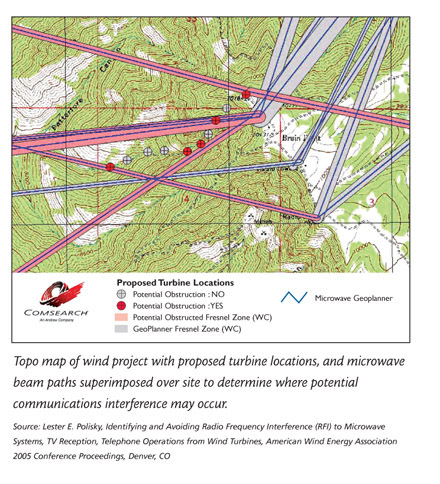 Wind projects have the potential to create problems with microwave beam communications that are used by emergency response agencies, the Department of Transportation and AM radio signals. The fiberglass blades can partially or completely block these signals, interfering with communication abilities. Before acquiring local and state building permits, it will be necessary to perform a radar beam path study. You can contact the Federal Communication Commission (FCC) to perform a communications tower search, which can identify potential interference from your wind turbines. Negative results from this study generally will not stop a project from moving forward. However, the study may dictate that you move some of the turbines in your project so that they are not within a beam’s path. There are also professionals who specialize in performing these studies. Hiring a consultant to perform the study will ensure that it is performed up to the standards required by state and local permitting agencies. As wind energy grows in the U.S., permitting of wind turbines has become a highly controversial and emotionally charged issue in some areas. Community wind developers can help assure a timely permit decision and reduce the possibility of protracted litigation by actively promoting general public involvement early in the permitting process. The general public includes residents and members of communities near the wind development and community officials and representatives of various interests, including economic development, conservation and environmental groups. Permitting and zoning policies and procedures vary greatly from state to state. This section provides basic information on wind turbine permitting in Midwestern states and includes useful links to more information in each state. These state-bystate descriptions are not a comprehensive list of permitting requirements within each state, but rather a starting point for your own research into your state. A number of counties in Illinois have adopted ordinances specifically pertaining to wind energy facilities. In many cases, these counties have made wind turbines and meteorological data collection towers (met towers) ”Special Uses” in areas zoned for agriculture. You should consult your county planning office to determine what kind of zoning applies to the property you are interested in and to inquire about any other relevant ordinances. Local zoning boards within each city council have authority over permitting wind turbines in Iowa. Most cities and towns have ordinances to ensure that structures and activities are safe, proper, and compatible with existing or planned development. Few ordinances specifically pertain to wind systems. Most municipalities either use existing ordinances regarding structure heights or require that an exemption from an existing zoning ordinance (a variance) be obtained from the zoning board. Some towns, particularly those in rural areas, have few or no codes to restrict the use of a wind turbine. Most restrictions occur in populated areas where height, safety, or aesthetics are issues. Mason City has a specific zoning ordinance for wind turbines within the city limits. 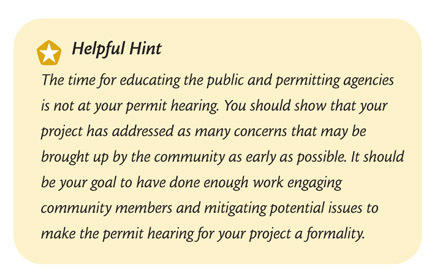 To find out about permit requirements in a specific area within the state, contact the zoning/permitting board that is local to the project with the legal description of the project site and they will work with you to determine what regulations your project will need to follow. Wind energy siting and permitting requirements in Kansas vary from county to county, based largely on whether or not the county is zoned. Statewide regulations for siting wind projects do not yet exist. The Kansas Renewable Energy Working Group released a handbook on siting and permitting wind projects in Kansas. Minnesota has a statewide policy for permitting commercial-scale wind projects that is one of the most user-friendly in the nation. The Public Utilities Commission (PUC) has permitting authority over Large Wind Energy Conversion Systems (LWECS) (systems over 5 megawatts), whereas smaller systems are subject to local jurisdiction unless the local agency defers to the state. The PUC states, "It is state policy to site LWECS in an orderly manner compatible with environmental preservation, sustainable development, and the efficient use of resources." Additionally, local jurisdictions can elect, in writing, to assume permitting authority for wind projects up to 25MW. Counties that elect to do so must assume the state guidelines as their minimum requirements. Visit the Minnesota Public Utilities Commission website for state siting and permitting rules and application processing scheme. The state of Montana has no ordinances specifically for wind turbines. However, at least one county (Madison County) has an ordinance covering tall structures, including wind turbines. The Montana Department of Environmental Quality has links to information on the permits that a wind project might require. The Montana State Legislature also maintains an index of Environmental Permits. In New York, most wind projects will have to go through some sort of local review process involving the municipal permitting authority. In general, the project will have to comply with local zoning ordinances and comply with the State Environmental Quality Review Act (SEQRA). Because New York State has relatively few wind projects installed to date, most municipal authorities will not have much experience with permitting wind projects. For more background on the permitting process in New York State, search the New York State Energy Research and Development Authority’s (NYSERDA) website for: The Roll of Government Agencies in the Approval Process. North Dakota has no specific process or governing authority for zoning and permitting wind projects. This has begun to cause problems with wind access rights in the state. However, there are likely to be other local zoning and permitting regulations that will apply to a wind project. In Ohio, the Ohio Power Siting Board has authority over any new generation facilities 50 MW or larger, including wind. Smaller developments are regulated by local governments and zoning boards. Wind energy siting and permitting requirements vary in Oklahoma from county to county, and local building codes and ordinances may also apply. On a statewide basis, there are no regulations specific to wind development, but storm water permits and zero-emission facility permits from the Oklahoma Department of Environmental Quality are needed. The state Public Utilities Commission gained authority over permitting of wind energy facilities through the South Dakota Energy Facilities Permit Act of 2005. For more information, visit the South Dakota Public Utilities Commission website. The Public Service Commission of Wisconsin has permitting authority over wind turbines, and a new state law prohibits local blockage of a wind project unless it poses a threat to residents' health or safety. Nevertheless, the zoning process in Wisconsin is not as smooth as it could be. Permitting can seem daunting because of the wide variation in regulations from place to place and range of agencies and governmental bodies who may have regulatory authority over your project. However, researching and understanding the permitting requirements for your wind project is a critical part of the development process. Be sure to research permitting issues early in order to avoid unnecessary delays and obstacles throughout your development process.